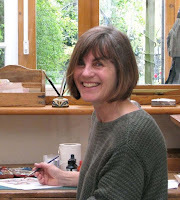 This month's Featured Illustrator is Cambridge based Gillian McClure. 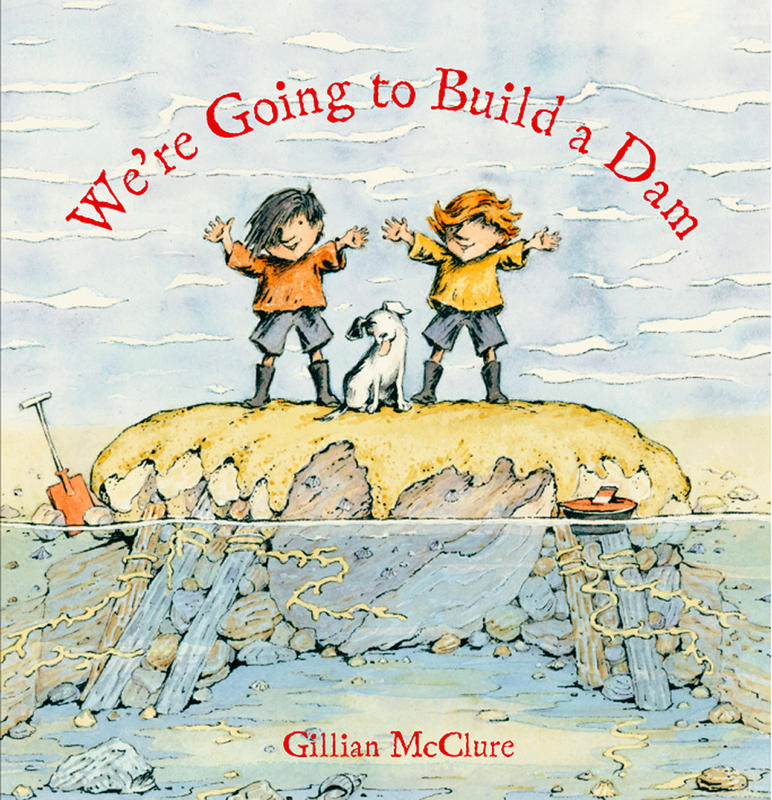 Not only a prolific picture book writer and illustrator, Gillian has hands-on experience of running her own publishing company and is a familiar face to SCBWI, regularly presenting workshops. 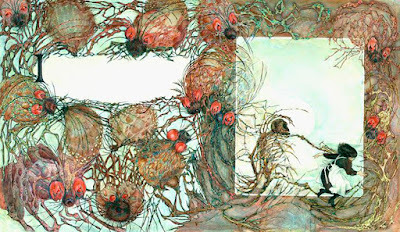 See more of her work in her Featured Illustrator Gallery. I spent my childhood writing and illustrating stories - often making family and friends pay to read them. I never thought of having any career other than that, even though I ended up going to university rather than to art school. The illustrators who influenced me then were Arthur Rackham, Gustave Doré and Edmund Dulac. I was lucky. It was the early 1970s when I embarked on my career. My first book The Emperor’s Singing Bird was accepted by Andre Deutsch with not much trouble at all as they were starting a new children’s list and Pam Royds became my editor for two decades, publishing all eight of my books. 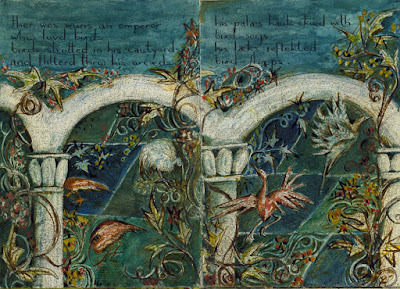 A page from the The Emperor’s Singing Bird dummy I submitted to Andre Deutsch written in the Initial Teaching Alphabet. Pam died recently and I wrote a piece about those years with her in my blog – telling of how I was nurtured and allowed to develop. During this period, I moved from my early experimental ink-splattering to acrylics and a finely worked style. 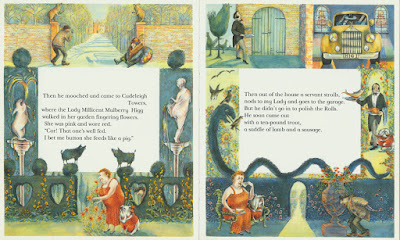 In 1985 Tog the Ribber was Highly Commended in the Kate Greenaway medal and shortlisted for the Smarties Award. Inside spread from Tog the Ribber, poem by Paul Coltman. 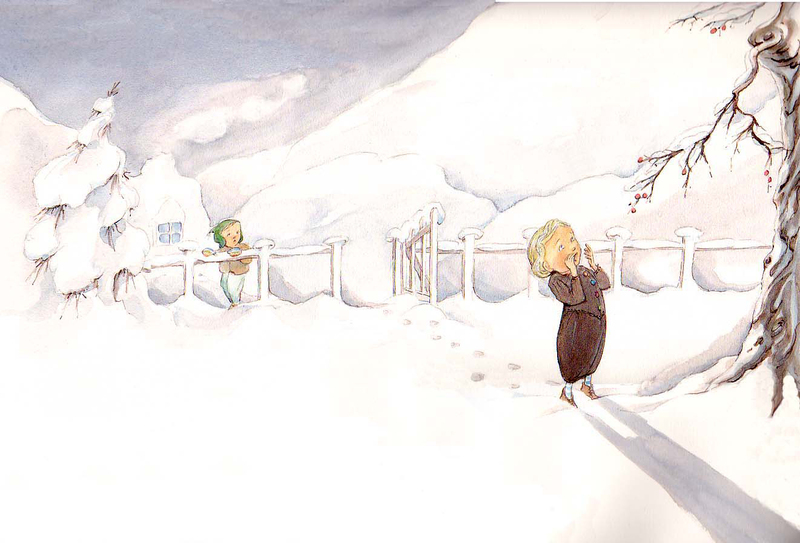 There were massive changes occurring in children’s publishing in the 1990s, as a global mass market came into force. This became clear with hindsight but I did not see or feel it immediately due to work still in the pipeline and a cushioning as a result of what I’d achieved up until then during my years with Andre Deutsch. The impact was going to hit me ten years later. Scholastic published three of my books including Tinker Jim in 1992 which was shortlisted for the Smarties Award. Illustration from, Tinker Jim, poem by Paul Coltman. I was still finding it relatively easy to get books published in this country and in the States where my publisher was Farrar Strauss and Giroux, but I was continually changing publishers, chasing editors I liked to work with as they moved about. In 1993 I was commissioned to illustrate The Norse Myths, written by Kevin Crossley Holland for Simon and Schuster’s gift book series. 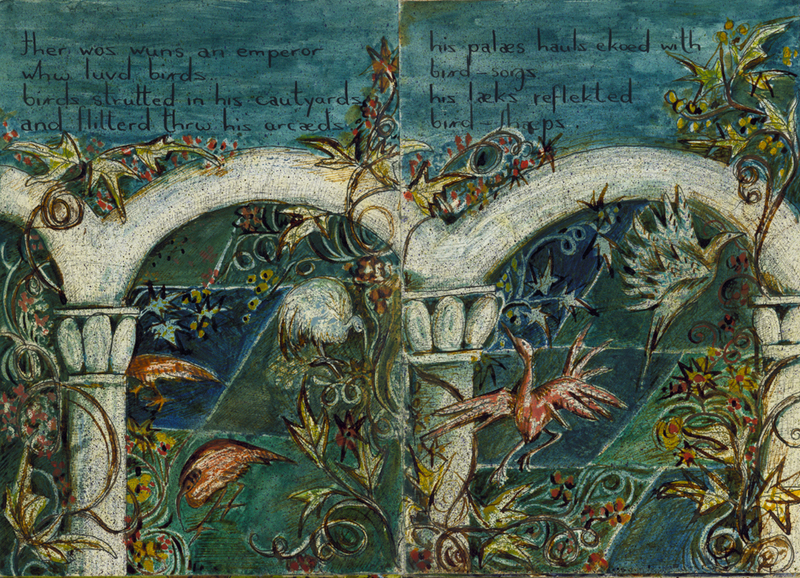 Illustration from, The Norse Myths. 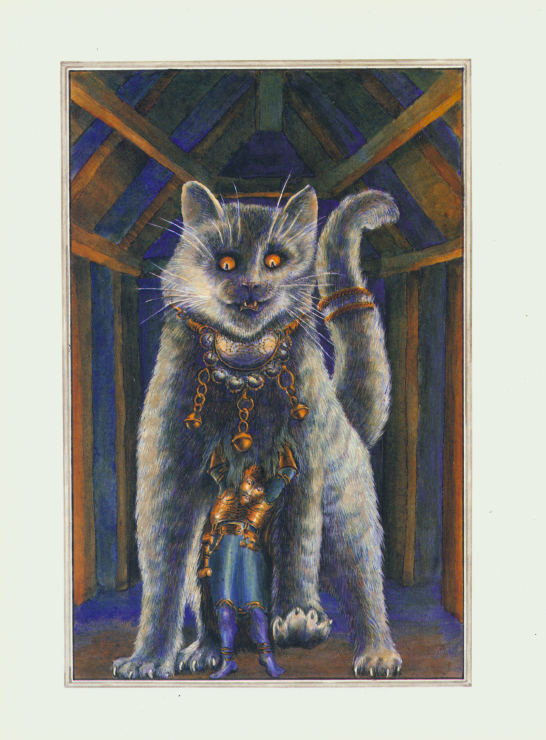 Another commission followed before Selkie was published by Transworld in 1999 and won the US Parent’s Guide to Children’s Media Award for Outstanding Achievement in Children’s Books. By the millennium, my trusted editors were gone and I found myself having to start all over from scratch and find new ones. A difficult time; a blank page in my career, accompanied by a radical change in style from acrylic to watercolour and the white page. Tom Finger was the book that resulted, published in 2001 by Bloomsbury who were, I suspect, taking on risky books, thanks to Harry Potter. Inside spread from, Tom Finger. Unlike the Andre Deutsch days, I was now given just a two book chance to succeed. My one-off picture books were becoming increasingly difficult to place and I found the only way forward was to fit in with an existing series. I turned to Frances Lincoln and did Mario’s Angels in 2006 for their art book series and in 2008 The Land of the Dragon King for their series of overseas tales. However, my time with Frances Lincoln was cut short as they were in the process of being bought up by Quarto and my books were put out-of-print. 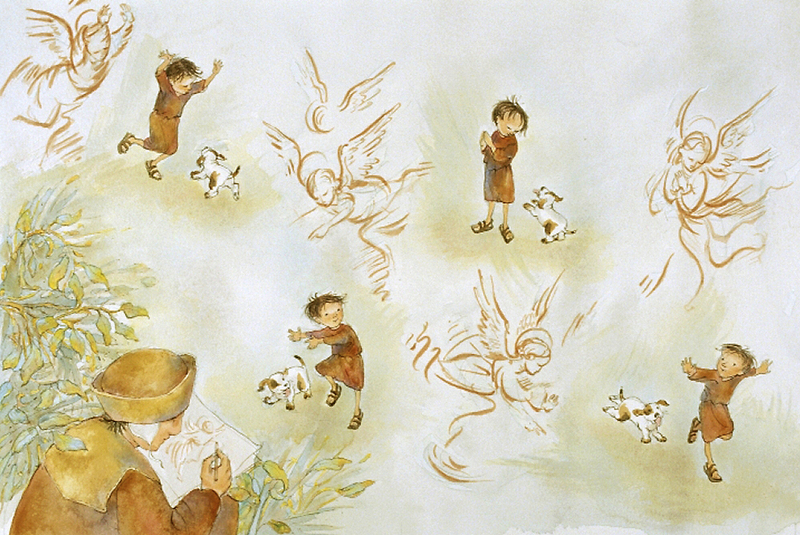 Inside spread from, Mario’s Angels, a story about Giotto. Inside illustration from, The Land of the Dragon King, Korean Tales. It was time to do something different. In 2010 I started Plaister Press, bringing back into print one back list title and publishing five new ones over the next six years. I returned to the freedom of those early Andre Deutsch days, waxing and splattering ink in Flood, 2014, experimenting with a graphic format for very young readers in Zoe’s Boat, 2012, enjoying typography as a component of the narrative in We’re Going to Build a Dam, 2013, and exploring every part of the physical book. Two of my Plaister Press titles were longlisted in the UKLA Book Awards. 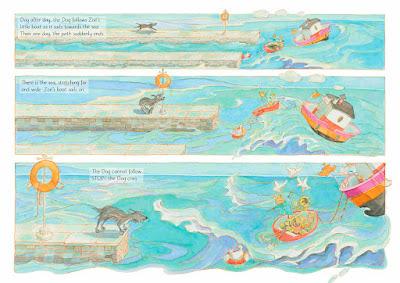 Graphic novel style spread from, Zoe’s Boat. 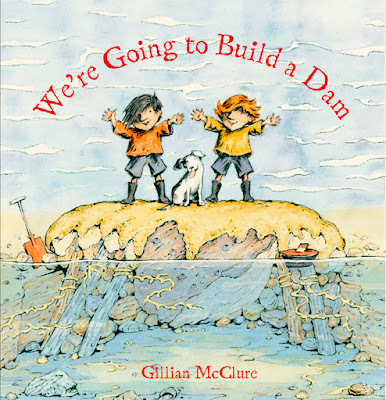 Cover for, We’re Going to Build a Dam. Front and back cover with flaps for, We’re Going to Build a Dam. However, as self-publishing started to mushroom, I became increasingly sensitive to stigma and barriers that created an uneven playing field in the route to market. So I decided to return to traditional publishing and in 2016 closed down Plaister Press. Troika Books will publish my next book, Dog on Wheels, early in 2017. I’m hoping, for the first time, to develop this doggy character into a series. 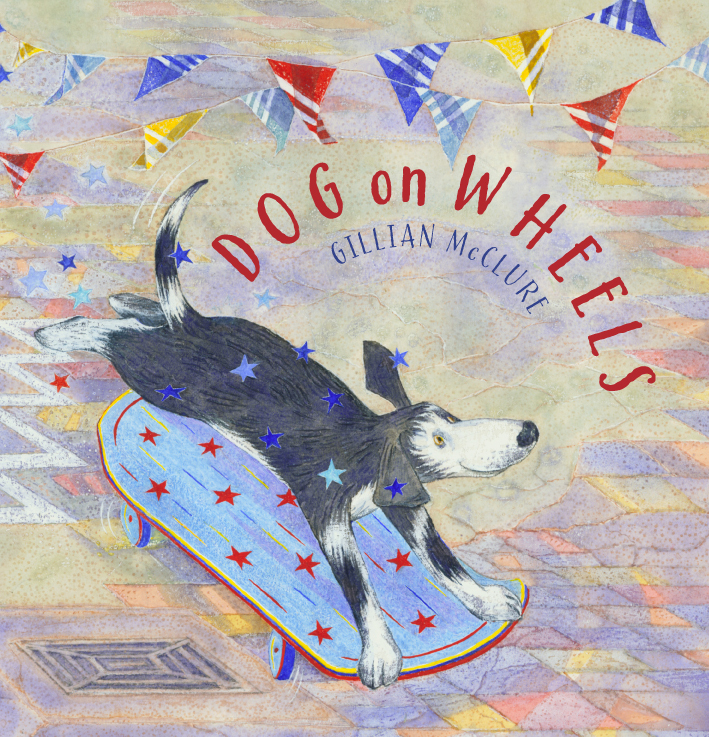 Dog on Wheels jacket image. 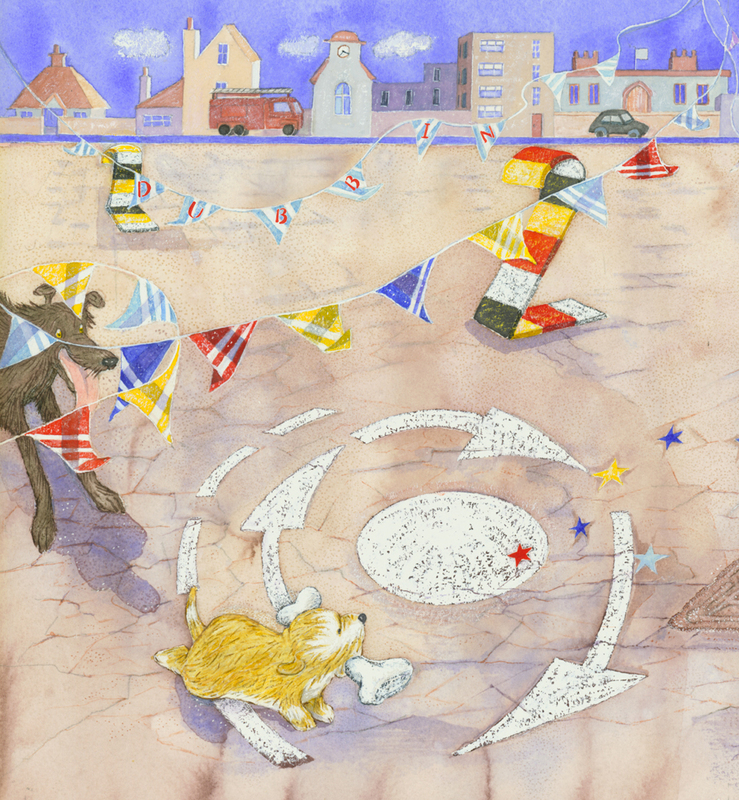 In Dog on Wheels I’ve experimented with white gouache effects and textures formed by rock salt dissolved in watercolour wash to get an interesting pavement look. 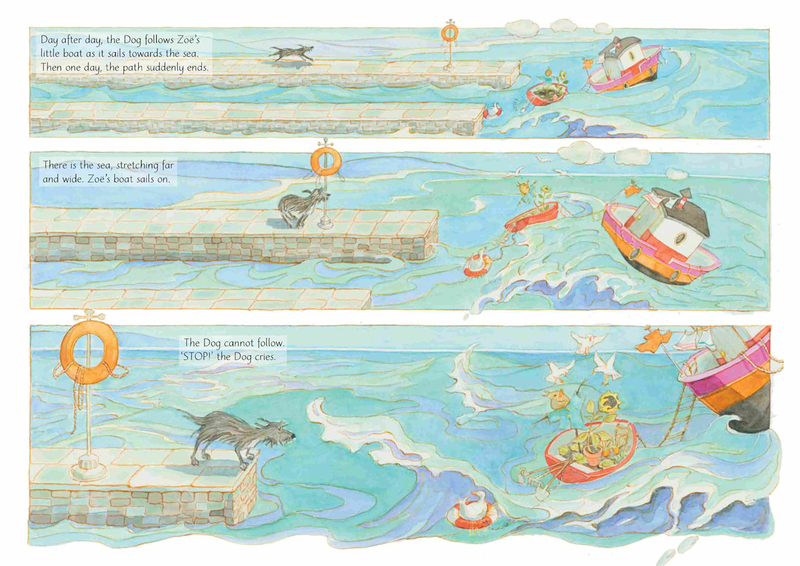 Inside illustration for Dog on Wheels, Todd. When I start on a new book, I have a sense in my head of the effect I want but it is often shadowy and I find art exhibitions distracting at this stage unless an artist fits in with what I’m searching for. The art of Ravilious, at the Dulwich Picture Gallery in 2015, inspired the look of Dog on Wheels, just as the art of Ben and Winifred Nicholson at Kettles Yard in 2014 inspired the decorative images in Mouse in the House 2015. 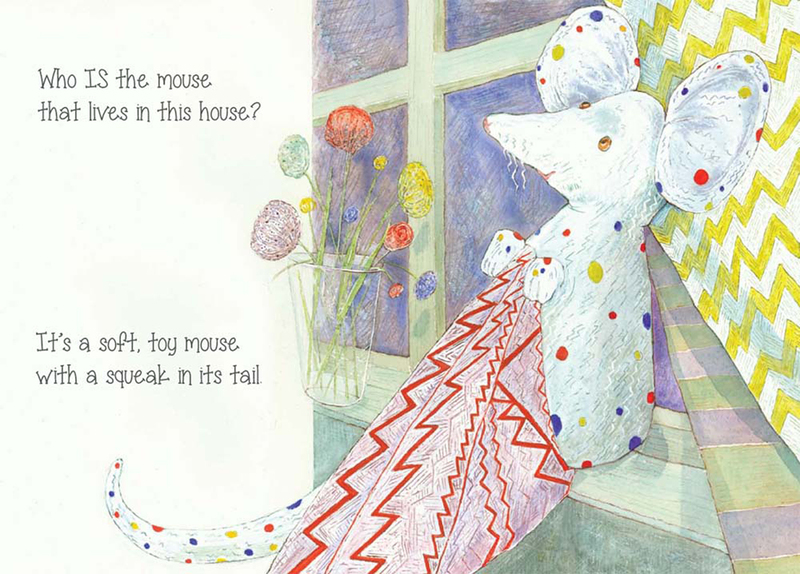 Cover for, Mouse in the House. 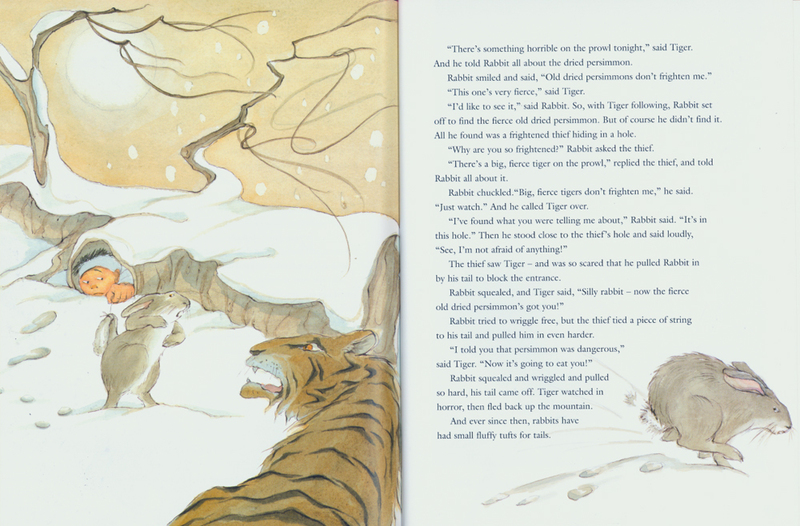 Over the four decades I have worked on picture books, I have never consciously followed the current trend. However, looking back at the changes in my style, I can see I was always moving with what was going on around me, as if invisibly joined at the hip with the look of the time. 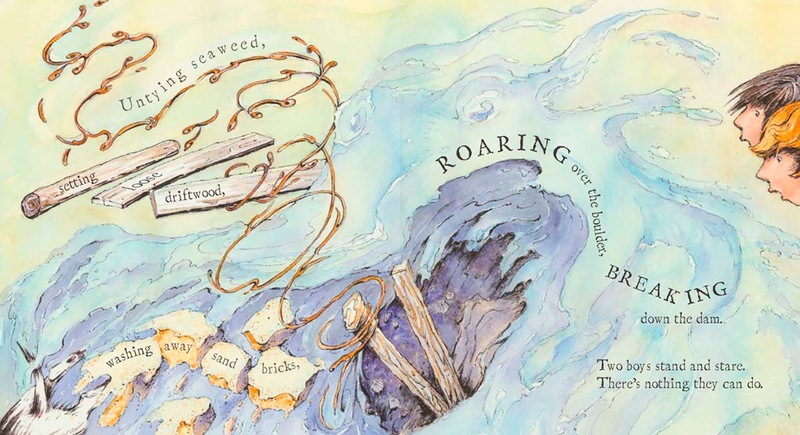 See more of Gillian's work in her Featured Illustrator Gallery. Such an amazing journey Gillian! I have a very similar background with Pam Royds, she was my first picture book editor too (shortly after you began working with her) - indeed a very wonderful woman, she agented me too for a short time, I was really upset when I heard of her passing. Excellent article and great to see such a range of your work. Best of luck with Troika! Thanks,John.You also must have experienced great changes in publishing for children.It feels much harder now!